Embark on a fascinating nocturnal fruit game trip with Reel Refill™ across 25 fixed lines and 5 reels. 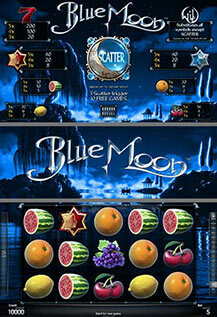 The Blue Moon™ holds the key to the feature games, with extra scatters and undreamt of wins! WILD substitutes for all symbols except MOON (Scatter) during the base game. 3 scattered MOON symbols trigger 10 free games. During the free games RED STAR and BLUE STAR symbols are additional scatters. Free games can be won again during the feature (5 for 3 MOON symbols, 10 for 4 MOON symbols and 15 for 5 MOON symbols) and are played at current bet.